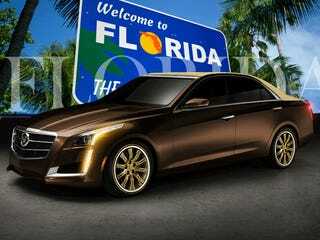 Having grown up in Florida I know all too well what happens to Cadillacs once they reach sunshine showrooms. Rather than wait for Joe General Manager to aesthetically botch a strikingly good looking car, I decided to do it on my own. White walled tires, landau roof, gold wheels and most importantly, a custom left blinker that NEVER TURNS OFF. Snowbirds, rejoice, for I have built your dream car.